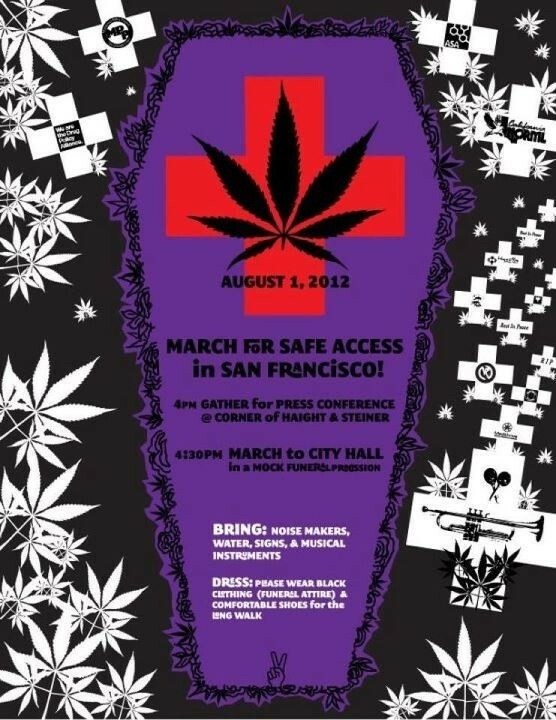 Vapor Room, HopeNet Funeral Procession in SF Starts at 4 p.m.
From Americans for Safe Access: "As two city-permitted dispensaries are shut down [July 31] after 9 years of service to thousands of medical marijuana patients, a coalition calling itself San Francisco United for Safe Access will stage a funeral procession with somber marching band, and a press conference [today] to bring attention to the federal government's ongoing attack on medical marijuana." U.S. Attorney Melinda Haag closed the dispensaries with threats of criminal prosecution and asset forfeiture. Haag has threatened and closed nine dispensaries in SF, Chris Roberts reports for San Francisco Examiner. "Advocates argue these closures are needlessly driving patients into the illicit market," ASA states. The Brass Mafia Marching Band will lead the procession of mourners dressed in white and black, and bearing coffins from Haight & Steiner to the press conference at 450 Golden Gate, the Federal building and offices of U.S. Attorney Melinda Haag. The funeral procession starts at 4 p.m. Press conference is at 5 p.m.
"U.S. Attorney Melinda Haag must be held accountable for her actions, which are completely inconsistent with Attorney General Holder's recent statements to Congress on medical marijuana," said Steph Sherer, Executive Director of Americans for Safe Access, the country's leading medical marijuana advocacy group and a coalition member of San Francisco United for Safe Access. "The Justice Department's attempts to undermine the implementation of state law and to deny thousands of patients a safe and legal means to obtain their medication must be stopped." In July, Haag targeted the property of Harborside Health Center in Oakland for forfeiture (slideshow) due to its size, her office states.